Due to copyright restrictions, this title is not available to customers in the U.K.
Elizabeth Jenkins was born in 1905 in Hitchin, Hertfordshire, where her father, James Heald Jenkins, had established the Caldicott School. Jenkins attended the Modern School and St. Christopher School, Letchworth, and the women-only Newnham College, Cambridge, where she studied English and history, though women were not eligible to receive a degree until 1921. Afterwards, she took a position teaching at King Alfred School in Hampstead. During the Second World War, she left her teaching position and worked assisting Jewish refugees and London air-raid victims for the Assistance Board. She later worked in government positions for the Board of Trade and the Ministry of Information. Through Newnham’s principal Pernel Strachey, sister of Lytton Strachey, Jenkins was introduced to leading literary figures Virginia Woolf and Edith Sitwell, and in the late 1920s Jenkins herself began to write. Her first novel, Virginia Water (1929) was praised by Woolf as “a sweet white grape of a book,” and the novel’s modest success led to a three-book contract with publisher Victor Gollancz. Jenkins would go on to write a dozen novels, the best known and most popular of which were Harriet (1934), based on a real-life sensational Victorian case, and The Tortoise and the Hare (1954), which Hilary Mantel, reviewing a Virago reissue in The Sunday Times, called “as smooth and seductive as a bowl of cream”. But Jenkins was perhaps best known for her nonfiction, including psychologically insightful biographies of Jane Austen, Lady Caroline Lamb, and Queen Elizabeth I. In 1940, she helped to found the Jane Austen Society and took part in its campaign to buy Austen’s house at Chawton. In 2004, Jenkins published a memoir, The View from Downshire Hill; the title refers to the Hampstead neighbourhood where she lived for more than a half-century in a Regency house she bought in the 1930s. 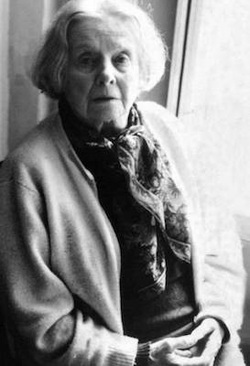 Elizabeth Jenkins died in 2010, aged 104.